← News Flash: New Baby Born @ Mercy House! There are many people and organisations working towards the same goal: improving child and maternal survival and health standards. In these profile posts I’ll try and spread the word on the good works people are doing to change the situation of mothers and their babies. During The Sunflower Effect, while we raise funds for The Mercy House Kenyawhich care for mums and their babies, we’ll also be supporting others who are doing good – it’s much more fun that way! Let’s get started on Profile #1! I was pretty chuffed when I saw the “I’ve Helped Empower Mums in Uganda” bags at our local Cotton On store. 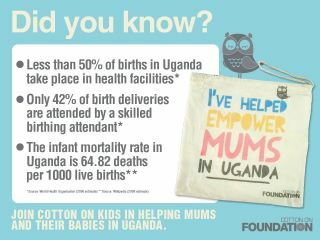 Companies like Cotton On have the opportunity to use their name and status to raise awareness on issues like child and mate rnal mortality. And of course they have done it in their signature funky style! Becoming a mother is one of the most special times in a woman’s life. It’s filled with so many joys and with pregnancy comes numerous important questions. Which hospital will I go to? What type of birth will I have? Will I breastfeed? We take this for granted but many women in developing countries are not able to make these choices. 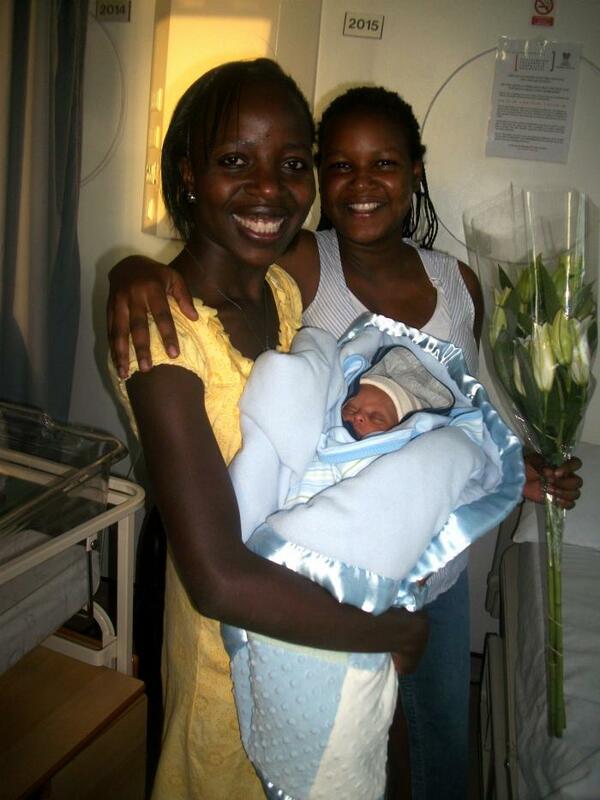 In Uganda, most women have never even entered a hospital. education sessions as well as extend their local hospital’s maternity ward, so that expectant mothers can have a safe place to deliver their babies. Knowledge will empower these women to make well informed decisions for themselves and their families, equipping them for a happier and healthier future. Proceeds will go to Mannya village in Uganda, a township of 7,000 people. The Cotton On Foundation has been working with the local community for five years, assisting them with funding for health, education, infrastructure and sustainability. Here are a few tips for helping out a disadvantaged mum today..
2. Visit your local Cotton On store and pick up one of these cute totes for $2 and show it off proudly. 3. While we’re talking about fashion for a cause – those dresses and scarves floating around the back of your wardrobe, never to be worn again? How about spruking them on eBay and donating the profits to The Sunflower Effect? Now THAT’S fashion for a cause 🙂 You could even mention in the ad that you’re selling them for a good cause – people might get behind you and bid even higher! OOPS! I almost forgot! Wanna support The Sunflower Effect blog project by making a donation? Visit the Razoo.com secure page here and donate away! All donations are tax deductible. yes. what you are doing means a lot and a token in the lives of Mannya village.